Your Celebs. Your Beauty. Your Culture. All Here. If you’re feelin’ this blog, you’ll absolutely looooove the print magazine! Why? Because we cover the Black girl’s mainstream. That means, we fill our pages with what those other magazines don’t — girls who look like you! 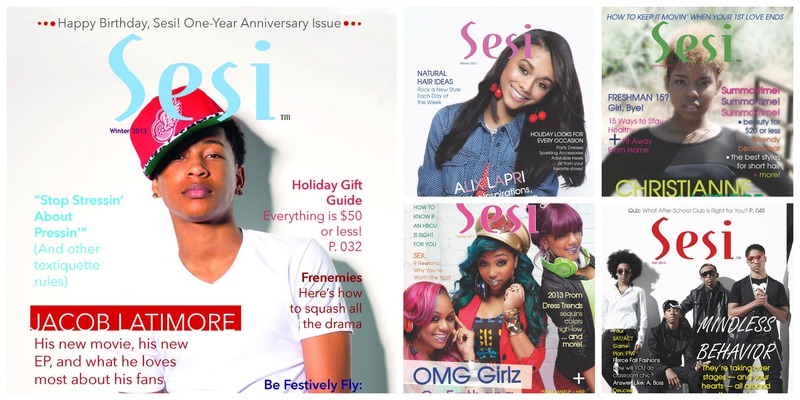 So far, Sesi has featured your favorite celebs — Keke Palmer, Drew Sidora, Hannah Hodson, Mindless Behavior, Alix Lapri, Christianne La’triece, the OMG Girlz, and Jacob Latimore! And there are many more to come! You’ll also find articles about beauty and fashion trends for Black girls, articles about dating and health, others about issues Black girls face (like color complex and racial profiling), and that’s just the beginning. Missed any of our previous issues? (*sad face*) But, no worries: You can make sure that never happens again by subscribing today. Soon after, you’ll find your own copy of Sesi waiting for you in your mailbox — pages and pages of your celebs, your beauty, your fashion, your culture. All up in there.